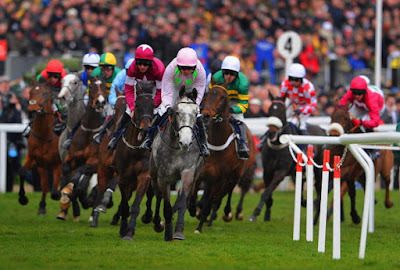 The 2018 Cheltenham Festival will soon be upon us with this year’s four-day spectacular running from Tuesday, March 13 to Friday, March 16. Horses of all ages compete at the Festival, but a number of exciting novices are threatening to steal the show from the championship races. Check out our five fancied novices probably heading to Cheltenham. No article on highly-regarded novice horses would do itself justice without mentioning at least one trained by Willie Mullins. The top Irish handler has hot even-money Arkle Challenge Trophy favourite Footpad looking like a banker bet for the Festival. Representing the two-tone green colours of owners Simon Munir and Isaac Souede, the six-year-old is unbeaten since switching from hurdles. Footpad has two Grade 1 victories in 2m chases over in Ireland under his belt, including when he finally turned the tables on old rival Petit Mouchoir at the inaugural Dublin Racing Festival last time out. Connections have also entered Footpad in the JLT Novices’ Chase at the Cheltenham Festival, but given his credentials over two miles, that looks the race he should line up in. Trainer Patrick Kelly and jockey Davy Russell teamed up to saddle and ride Presenting Percy to Cheltenham Festival glory last year in the Pertemps Final. Since then the seven-year-old has switched to fences, winning two of his three chase starts. Although beaten in the Grade 2 Florida Pearl Novice Chase in November, he can be forgiven an off day. Presenting Percy bounced straight back to form by winning over the Irish Grand National trip in a Grade B Fairyhouse handicap next time up. He showed strong staying credentials which mean connections have options come Cheltenham Festival. Presenting Percy is favourite for both the RSA Chase over 3m and the 4m National Hunt Chase, so will doubtlessly attract punters to spend the free bets seen at Timeform. Sticking with the Irish raiders, Samcro looks their best bet of a winner at Cheltenham this year. Trained by Gordon Elliott and owned by Gigginstown House Stud, the six-year-old is unbeaten in half-a-dozen starts under rules. With a Grade 1 already under his belt, Samcro could go for either the 2m Supreme Novices’ Hurdle or step up to 2m 5f for the Ballymore Novices’ Hurdle at the Festival. He is currently second-favourite for the Supreme and odds-on with most bookmakers for the Ballymore come Cheltenham. Among British trainers, Nicky Henderson looks set to have a great Festival once again and Santini has shaped like he’ll stay 3m for a tilt at the Albert Bartlett Novices’ Hurdle. This six-year-old shares a sire with 2015 renewal winner Martello Tower and last year’s Grand National hero One For Arthur, so that is evidence he should stay. Besides the breeding, Santini also has a point-to-point win at the trip to his name alongside a Grade 2 for novice hurdlers over two-and-a-half miles at Cheltenham. That all adds up to massive potential for the future, but he may deliver on that in the Albert Bartlett. Ben Pauling stable star Willoughby Court made all in last season’s Ballymore at the Festival and switched to fences for this campaign. Heavy going, different tactics and belting four out saw him lose his unbeaten chase record in the Dipper at Cheltenham on New Year’s Day. There’ll likely be better ground come the Festival and Willoughby Court thus remains the ante-post favourite for the two-and-a-half-mile JLT. It looks this jumps novice’s Cheltenham target because stepping up to 3m and tackling the RSA is a bigger price in the betting.